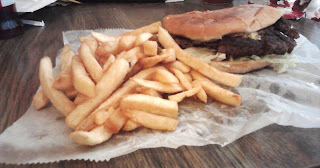 Today, I d ecided to head over to Big Burger for lunch, and I had an awesome burger. I decided to go with the burger joint's namesake, the Big Burger, which consists of a 1/3 pound of ground beef, cheese, lettuce, tomato and mayonnaise. From tasting the burger, the meat seemed like it was seasoned with a combination of salt and black pepper and cooked to about "medium well-done." When combined with the other toppings, this is one delicious burger. The French fries were pretty good too, having a taste similar to McDonald's fries. When comparing the burger to other places in town, including my favorites Sweden Kream and Kooky Canuck, Big Burger can hold its own with the best of them. While waiting for my burger, I glanced over the menu and noticed that Big Burger also sells sandwiches and surprisingly, pizza. The pizzas can be ordered in either 6" or 9" sizes, with a selection of these toppings: sausage, pepperoni, beef, ham, turkey, black olives, mushrooms, tomatoes, onions, jalapeños, green peppers. 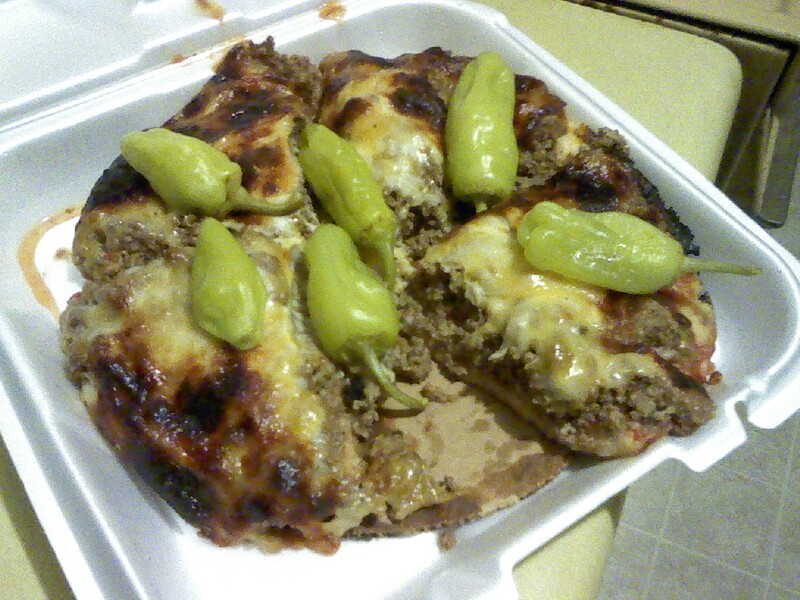 Whenever I get the chance, I will try one of Big Burger's pizzas. As for the service, the staff at Big Burger was very courteous and it didn't take long for me to get my order. As a result of my experience, I will definitely return again, although because it is in a not-so-nice part of Memphis, I don't think I'll be making any night visits. Overall, Big Burger definitely lives up to its name, and as far as burgers joints go, it is one of the better ones in Memphis. For another opinion, check out the Commercial Appeal's Whining and Dining blog. The burger made it into its "best meal of the week" feature. After ha ving an outstanding burger from Big Burger, I decided to give one of its pizzas a try. I initially wanted to get a 6" sausage pizza, but was told that the topping wasn't available, so I went with a beef pizza instead. The pizza consists of ground beef (about 1" thick) covered with cheese and jalapeños with hardly any tomato sauce, and it was quite filling. However, unlike the Big Burger, the beef seemed unseasoned and had a bland taste, and the cheese (Mozzarella, I think) didn't help. Speaking of the cheese, it would have been nice if the cheese had melted more into the beef, which could have made it easier (and less messier) to eat. To make it palatable, I added Parmesan cheese and McCormick's "Grill Mates" Hamburger Seasoning, which provided some pizazz. From eating the beef pizza, I don't think I'll be getting another one from Big Burger. While its burgers are great, if the pie I had was indicative of the quality of its pizza menu, I would advise going elsewhere for a pizza.